Reading through the latest issue of Cooks Illustrated, a recipe called "Wild Rice and Mushroom Soup" caught my eye. It looks hearty, healthy, and perfect for winter. However, I knew I'd have to do quite a bit of tweaking to make it kosher because it uses chicken stock and heavy cream. I decided to use the chicken stock because it seemed that the meaty flavor would be too good to pass up with the wild rice and mushrooms. I also further highlighted this aspect by incorporating many vegetables that boosted the umami flavor, such as carrots, sweet potatoes, and sun-dried tomatoes. Instead of the cream, I used vanilla almond milk because I liked the idea of having a sweet nuttiness in the soup. I also added a lot more vegetables because I love a very chunky soup and they add nice color and flavor. I also made a bunch of other tweaks, changes, and adjustments just based on my own preferences and what I had on-hand. So in fact, I would bet this soup tastes quite different than the original, but it was delicious all the same. There are some great tricks in here from the original recipe, including the use of baking soda to speed up the cooking time of the rice and cornstarch to thicken the soup. This soup is unctuous and has a sweet and earthy flavor with an almost velvety texture. It has a nice blend of creamy thickness and chunky heartiness. It's perfect on a chilly or rainy day. Bring 4 cups of water to a boil with the bay leaf, thyme, garlic clove, 3/4 tsp salt, and baking soda. Once water is boiling , add the wild rice. Make sure the water returns to a boil, and then put the saucepan covered in the oven. Leave for about 30-35 minutes until the rice is tender or almost-tender. Strain the rice and save the cooking liquid. Discard Bay leaf, garlic, and thyme if you used a sprig. Add more water to the liquid to get a total of 3 cups of liquid. While your saucepan is in the oven, put the oil in a dutch oven on a high flame and add the mushrooms, carrots, onion, sweet potato, garlic, sun-dried tomatoes, 3/4 tsp salt, and 1 tsp pepper. Cook and stir until veggies are browned and soft - about 15 minutes on a medium-high flame, followed by 10 minutes simmering on a low flame. Add the wine to the dutch oven and cook with the vegetables until reduced, about 2 minutes. Add reserved cooking liquid, chicken broth, soy sauce to the dutch oven and bring to a boil. Simmer for 10 minutes, and then add the cooked wild rice. Then continue simmering for another 10 minutes. Whisk together the cornstarch and last 1/4 cup water in a bowl. Pour and stir the mixture into the soup, and then cook until it gets a bit thicker, about 2 minutes. Turn off the flame and then cover the soup and let it stand for 20 minutes. 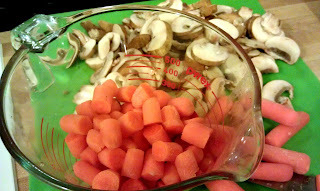 To make this recipe vegetarian/vegan, simply replace the chicken broth with vegetable broth. I found that when leaving the soup to warm for a while or later on when reheating it, sometimes it got a bit too thick just add water in increments until it's the consistency you want again and reheat it together.